This Royal Horticultural Society guide is written in the United Kingdom by horticulturalist David Stuart. Often we find that books written outside the United States have limited appeal for gardeners in the US. This book is an exception. Mr. Stuart's 14 years as curator of Longstock Park Gardens, where the British National Collection of Buddlejas is held, inspired him to fully investigate this genus at home and abroad. 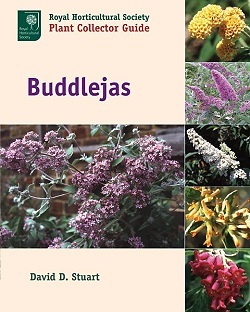 Buddlejas is the first ever comprehensive look at this diverse group of plants. Over 150 Butterfly Bushes are described and there are numerous color plates to help with identification. More than just an encyclopedic tome, there are most helpful sections on growing as well; including propagation, pruning, and mulching. Written by one who knows how to help others who are learning, Buddlejas is a truly valuable book for anyone interested in Butterfly Bushes.